When you look at the Windows Experience Index (WEI), you see certain information about your PC. Have you ever wondered how you can increase the numbers without PC maintenance or purchase of a new PC? This article will detail a hack the WEI and indicate any desired numbers. The reasons for doing this involve the Windows Experience Index API. The API in the WEI is used to enable the functionality of various programs. If the score is low, there will be impaired functionality of some sectors of a given program or the program could be completely disabled. This obviously can pose some problems. Basically this hack tricks your operating system to enable you to use features. This method is a little advanced, as it does require at least basic knowledge of XML files. Just stick to these instructions and you will make it through. Before proceeding, please create a System Restore point. Begin by navigating to C:\Windows\Performance\WinSAT\DataStore. Open a file ending with Formal.Assessment (Initial).WinSAT. There may be more than one file like this. If so, check the file dates and use the most current file. Right-click the file and select edit to open the file in the notepad. Click on the Edit menu and then click find in the dropdown menu. A dialog box will open. Type ‹WinSPR› in the dialog box. Click “Find Next”. Notepad highlights where the code starts. This is the code that will be edited. Any WEI values can be edited. The following list shows what tags edit certain values. For this demonstration, the tags you are looking for are the ones that follow the WinSPR tag. C:\Windows\Performance\WinSAT\DataStore. Select Move and Replace in the window. You will then be prompted for administrator permission. Click “Continue” and you will be prompted to provide a password if you are not already logged on as the administrator. Now go back to the Windows Experience Index and notice the changes. All you have to do is enter the numbers as you see fit. The range is from 1 to 7.9. Change one or more of the values. You can change all of them if you wish, keeping in mind that the overall system rating is based on the lowest score. 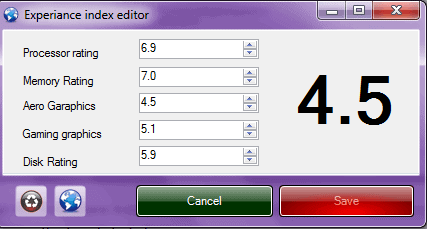 To make changes in the future, the program can be found in the Downloads folder in Windows 7 and will be titled “experience_index_editor.exe. To reset WEI true values, open WEI and click “Re-run the assessment”. This may seem like it would improve system performance, but it will not. All this will do is enable additional functionality. What sort of functionality will be enabled? The API in the WEI is used to enable the functionality of various programs. If the score is low, there will be impaired functionality of some sectors of a given program or the program could be completely disabled. This obviously can pose some problems. Basically this hack tricks your operating system to enable you to use features. I have never heared of software being (partly) disabled on basis of this score. But lets say some software does this: why would you want to hack it if it did? For example: a game might load giant textures because you score a 7,9 on the RAM part (meaning you have 12GB+ RAM or so) but in reality you only have 4GB. I guess this is just to show off then? I’d also say it is more for showing off. Then again, if your system scores 4.9 and you need 5.0 for a functionality, you might want to hack the score to enable it. What to type in the dialog box? Sorry, the blog hid some chars, I have corrected it now. This is useful for those who still want to enable Aero after they got a WEI Graphics score of below 3.